Oh yes, we booked a holiday to Goa, flying on New Years Eve 2007. So our New Year celebration willl be during the flight and we will arrive on new years day. That means that technically it’s a holiday in 2008. I’ll revist this later in the year and see how we’ve done. In almost unbelievable, extra-ordinary news, I used the name of the Iranian President, Mahmoud Ahmadinejad, in conversation last Thursday. I know! and I even pronounced it correctly thanks to that nice lady from the BBC pronounciations department. I was wrong of course, because sooner or later you’re going to have a drunken conversation about the worlds scariest places to live. Iran is #2, not sure I can remember the full list now, I can’t even remember what was #1. Its very early, I know, but I’ve taken a chance on planting a few seeds. I’m hoping for a head start and that we wont have to cold a Spring this year. The tomatoes I grew last year were really good and I’m hoping for more this year. I’ve also got some different varieties to try this year. I put them in yesterday and they are now in the airing cupboard and we’ll see if they germinate. I’ve put in 2 Moneymaker Tomato, 1 Cherry Plum Tomato, 1 Tumbling Tom and 2 Cucumbers. This year I’m all about the succesional sowing so I’ve just put a few in and I’ll do more in a couple of weeks. I hope the Cherry Plums germinate, I actually harvested the seed from a supermarket Tomato following the instructions here. The Tumbling Tom is a hanging basket variety and I’m really looking forward to seeing how that looks/works. I’ve not done cucumbers before so that will be interesting, wonder how they’ll do? Oh, and I got some seed potatoes too, I have to do something called chitting before I can do anything with them though. I’m planning to do 2 early potatoe plants started of inside and then grown on in big pots, one to a pot. That will good if it works. I’m going to get one of those small plastic greenhouses this year too, I’ve just got to convince Paul about where I want to put it! My version of a pie floater, a la Harry’s cafe de wheels. PiePeasGravy 006 Originally uploaded by Andy2Boyz. 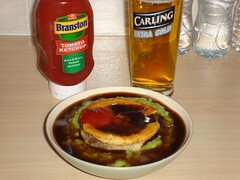 Last nights dinner, Steak Pie and Mushy Peas with Gravy and Ketchup, helped down with a glass of ice cold lager. I love mushy peas, I do. Anyway, I was thinking how to spice up and revive the whole BB franchise. And, take note Endemol, I’ve got it. I present to you, >>>>>>> Big Brother Tramps. Oh, yeah, thats right baby, Tramps! After nationwide auditions of homeless alcoholics , we get 13 weeks of dirty Tramps constantly fighting and/or drinking cider. If they try to sleep they shock them with some high voltage stun gun things. Can you imagine? I know! The shoppping list will consist of cigarettes, cider and pot noodle. If things get boring, BB either takes away half the booze and chaos ensues or BB throws more booze in and chaos ensues. 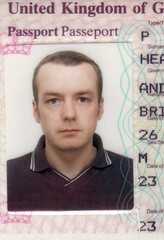 The worst thing is that you are stuck witha Passort photo for 10 whole years. I’m going to a photo-booth this morning. I had it done this morning, and not great photos but I’ve posted it and thats that! The pics are actually pretty rubbish, not sure if the booth was working properly? 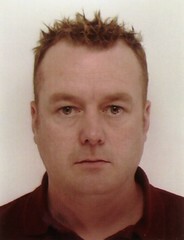 You cant even make out my eye colour properly. On the motorway the other day we passed and were passed by lots of builders vans. Isnt it funny that all the passengers are always asleep? No matter the time of day or the number of passengers, they are all asleep, except the driver of course. On the coach the other day we were laughing at the sleeping builders, as you would, some sleeping with heads back, some heads forward. Some with head against windows even some with tongues out. The driver of the van may as well have been pimping his mate! He keep overtaking, then we overtook and then he gained on us again, plenty of time for all of us to have a good look. Sharon spotted the toilet roll on the dashboard, “what’s that for! !” she tried to say, whilst laughing so hard I though she’d choke. I wonder if the drivers of all those vans get to sleep when they drop off the others to go on site to build things?? You are currently browsing the Andy2boyz's Weblog blog archives for January, 2007.